Be the first to share your favorite memory, photo or story of Wilda. This memorial page is dedicated for family, friends and future generations to celebrate the life of their loved one. 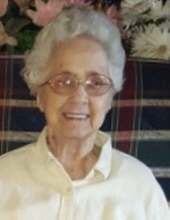 Minerva Brown, age 90, of Norcross, GA, passed away Friday, April 5, 2019. The Funeral Service will be Monday, April 8, 2019 at 11:00 a.m. in the Peachtree Corners Chapel of Crowell Brothers Funeral Homes & Crematory. Burial will follow at Peachtree Memorial Park. The family will receive friends Sunday, April 7, 2019 from 5:00 p.m. until 8:00 p.m. at the funeral home. Minerva loved gardening and shopping. She is preceded in death by her parents, Samuel Bertrum and Ethel Wood and sisters, Ursula and Kathryn. She is survived by her husband of 65 years, John Robert Brown; son, Stanley Robert Brown and wife, Kim; sister, Marylise Baker; grandchildren, Jason Robert and Natalie Brown, Kristi and Phillip Walker, Glenn and LeAnn Hatfield and five great grandchildren. Online condolences may be expressed at www.crowellbrothers.com. Arrangements by Crowell Brothers Funeral Homes & Crematory, 5051 Peachtree Ind. Blvd., Peachtree Corners, GA 30092 (770) 448-5757. To send flowers or a remembrance gift to the family of Wilda Minerva Brown, please visit our Tribute Store. "Email Address" would like to share the life celebration of Wilda Minerva Brown. Click on the "link" to go to share a favorite memory or leave a condolence message for the family.